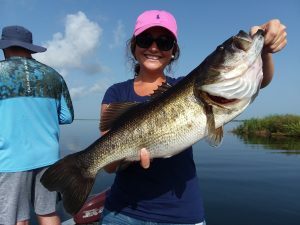 Hayley Leach her boyfriend and her Dad cam down to Lake O to catch some Okeechobee Large Mouth and they were not disappointed catching this nearly 7lb. large mouth and 25 more. The sun and weather have played along this last few days making fishing great and the days beautiful. Hayley and Dalton are both in college at U.K and are huge basketball fans but love to spend their time fishing.